The Maasai tribe is known for its warriors and its peculiar culture. To survive, the Maasai raise cattle and encourage hunting. In addition, the people are organized in a society, where they are led by a regional chief and his advisors. The warriors of the Maasai tribe, the Morans, live a period of their lives isolated in the jungle to learn the customs of the tribe and survival skills from the elders. Known for their remarkable bravery, they are able to hunt and overpower lions. For this, they use their intelligence and work in a team. Carrying only spears and arrows, the plan is to let the lions kill the animal and then steal their game, from right under their noses. Lions are not easily intimidated, so any careless act can be fatal. The video below shows the impressive courage and the strategy the Maasai warriors use to steal game from lions. This impressive tribe lives in the region of Kenya and Tanzania, in Africa, and has many communities throughout these two countries. All the young men of the tribe want to become a warrior one day. Through rituals and ceremonies, the young men are taught by their parents and elders, how to achieve “Moran hood” (warrior hood). They protect their people from external attacks and also recover cattle that are stolen by neighboring communities. However, since their origin, the Maasai do not accept foreigners or “white men” – called Muzungu – on their land. They are very guarded and do not present themselves in a friendly manner, because on several occasions, visitors marketed their culture through photos and videos, or tried to somehow bring harm to the tribe. Nowadays, these people face many difficulties for survival. For this reason, the Universal Church, through evangelistic work, decided to help them. Our first visit to their community happened a little over 1 year ago. Since then, the Church has slowly been gaining their trust. 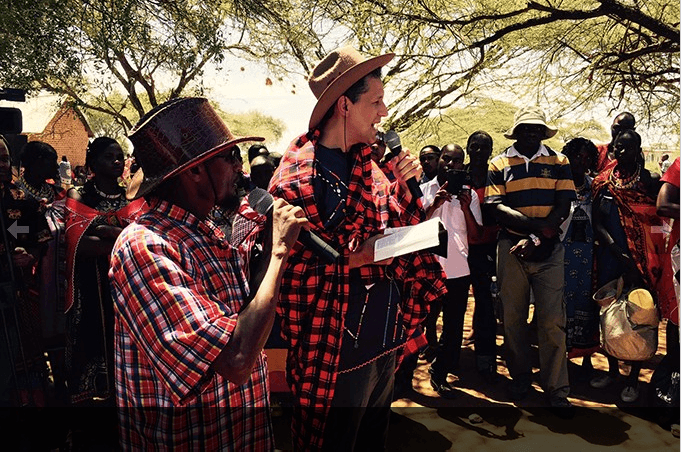 At the tribe’s own invitation, on the 9th of February, Bishop Marcelo Pires, responsible for UCKG in South Africa, was present at a ceremony where he would become a Maasai Moran, a warrior (photos). It took three hours of travel, through a very bumpy road, formed of earth and stones, to get to the meeting place in the town of Kajiado, 80 kilometers south of Nairobi, Kenya (see map). Bishop Marcelo’s wife, Marcia Pires and Bishop Gerald Nkayi – responsible for UCKG in Kenya – and his wife, Thokolize, also attended the meeting. Assistants and members helped by donating food and hygiene products to members of the tribe. The ceremony was very festive. The Warriors performed a dance and ritual of acceptance of a new Moran, receiving Bishop Marcelo as a member of the tribe, which, as a mandatory custom, he was given a new name, Saruni, which means “one who helps”, and a kind of colored stick, decorated with local artwork, the “olartat”. The tribal chief translated as the Bishop thanked everyone for the opportunity of belonging to their community and added that they don’t need to be insecure about the problems they are facing, because, like the Morans, who are brave enough to face lions, each one needs to have the same strength to face health, family and material problems that afflict them every day. He also added that the Maasai have to believe in God so that they can overcome the challenges, just like King David defeated Goliath. In the end, the bishop prayed for everyone and determined that they were blessed. In addition to free access to preaching the Word of God among the Maasai – the people who take game from lions using only spears and arrows –, the Universal Church also gained permission to open a temple in the community.